Diwali Muhurat Trading is auspicious occasion for stock market trading. Muhurat Trading is held for an hour on the Diwali day every year. To make this Diwali celebration special ICICI Direct is suggesting Best Diwali Muhurat Picks for 2015. This year was not so good year for stock market investor lost lot of money. Market was volatile initially and rebounded by 8% from recent lows to 7540 to 8150 currently. RBI Rate cut announcement was major factor in rebounding the market. ICICI direct expects that sensex earnings will grow by 13.2% in FY16. Sensex is likely to touch 30300 level by September 2016 while Nifty will be reaching 9100. 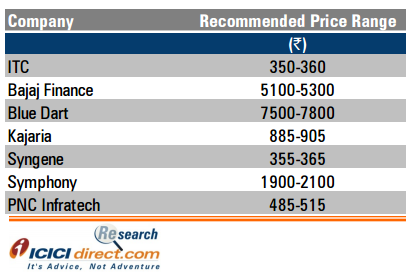 7 Top Diwali Muhurat Picks by ICICI direct are given below. ITC is the largest cigarette manufacturer and among the largest paperboard manufacturing companies in India. The company also has the second largest hotel chain in the country and is aggressively acquiring a strong position in the FMCG space. Bajaj Finance (BFL), is one of the leading asset finance NBFCs. The USP of BFL is its stronghold in the consumer durable (CD) & lifestyle product financing business. These segments are under penetrated & growing in size. Owing to its strong underwriting processes, focus on affluent & mass affluent clients, NPA is expected to remain acceptable. Further, such healthy asset quality and higher yields in the CF space enable BFL to earn one of the highest margins among its peers of ~10%. We assume this will largely be sustained, going ahead. BlueDart continues to be a market leader in the air express market with ~52% market share. However, it has 15% market share in ground express. BDE offers an entire range of services from a document to an entire charter load of shipment. Having a strong fleet of six aircraft & 8685 vehicles, it serves 34257 locations, with more than 220 countries. With customized solutions like time & day definite solution and packaging solutions, BDE is a one-stop shop for logistics requirement of its clientele. With a continuous increase in internet penetration & growing usage of smart phones & tablets, popularity of ecommerce is rising in Tier II, Tier III towns. E-tailing is likely to maintain strong growth momentum of ~54% in FY15-18. Current e-commerce contribution to total revenues for BDE is 26% that is expected to grow faster. Also, BDE has set up a 1,00,000 sq ft e-fulfilment centre, which operates on activity based revenue model. Kajaria Ceramics is the largest manufacturer of ceramic, vitrified tiles in India. Being the market leader, it has significantly increased its capacity from 30.6 msm in FY11 to 59.1 msm in FY15. This was driven mainly by the acquisition of a stake in Cosa, Soriso, Vennar and Jaxx and expansion/conversion of existing facilities. We remain positive on Kajaria given the sturdy growth in the industry, favourable structural shift, its better margin and return ratio profile coupled with a strong balance sheet. We expect the topline and bottomline to grow at a CAGR of 18.9% and 27.8%, respectively, during FY15-17E. Syngene International (SIL) is the contract research organisation (CRO) arm of Biocon. SIL caters to outsourced research requirements of global pharmaceutical, biotechnology, agrochemical, consumer health, animal health, cosmetic and nutrition companies on a fee-based contractual arrangement. Due to its integrated service offerings coupled with consistent performance and high data integrity ethos, Syngene enjoys high recall value, which is reflected in the fact that eight out of top 10 clients have been engaged with the company for the past five years. Symphony is India’s leading evaporative air cooler manufacturer with a market share of ~55% (value terms) in the organised product category. Symphony operates through an asset light model wherein it outsources manufacturing of air coolers to about nine exclusive vendors in India and uses the cash and carry model for sales. It has maintained strong return ratios i.e. RoCE and RoE at 39% and 35%, respectively, in FY15 mainly due to an asset light model and almost debt-free status. PNC has eight projects in its BOT portfolio including an OMT project with total size of 953.8 km comprising both toll, annuity assets. Out of eight projects in its BOT portfolio, six are operational & two under construction. Overall, total equity requirement for existing BOT portfolio is 876.1 crore of which PNC’s share is 487.4 crore & has been fully funded. We expect revenues & bottomline to grow at CAGR of 21.7%, 26.8% respectively during FY15-FY17E. 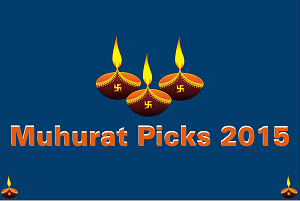 Download Full report on Best Diwali Muhurat Picks 2015 by ICICI Direct here.